Directions Bilingual instructions included. Important: Follow full directions enclosed. Uses All beautiful color - no gray. That's what you get with ColorSilk. 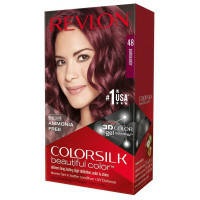 Because Revlon's deep-conditioning color technology penetrates every strand for beautiful, even color from root to tip. While rich conditioners nourish hair inside and out. 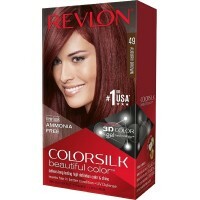 Your hair is silkier, shinier, healthier-looking - in better condition than before you colored. 100% gray coverage - covers even stubborn grays. Ammonia-free for maximum gentleness. Natural, stay-true color resists fading. 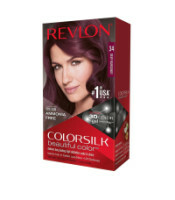 Deep Burgundy: Livens up dark hair with rich plum tones. 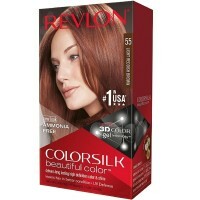 For dark blonde/light brown, medium brown, dark brown/black. Salt and pepper: A highlighted effect, with gray hair appearing lighter than non-gray. 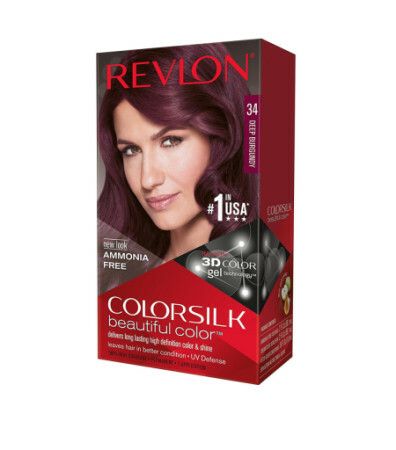 More than 50% gray: Slightly lighter and brighter burgundy than shown in the color guide on package. Natural red: Vibrant burgundy. Warnings IMPORTANT: HAIR COLORANTS CAN CAUSE ALLERGIC REACTIONS WHICH IN RARE INSTANCES CAN BE SEVERE. TATTOOS MAY INCREASE YOUR RISK OF ALLERGY. TO REDUCE YOUR RISK, FOLLOW THESE INSTRUCTIONS. DO NOT USE THIS PRODUCT AT ALL IF: YOU HAVE ALREADY EXPERIENCED ANY REACTION TO COLORING PRODUCTS; YOU HAVE A SENSITIVE, IRRITATED OR DAMAGED SCALP. IN THESE CASES CONSULT A DOCTOR BEFORE USING ANY HAIRCOLOR PRODUCT. PERFORM A SKIN ALLERGY TEST 48 HOURS BEFORE EACH PRODUCT USE EVEN IF YOU HAVE ALREADY USED COLORING PRODUCTS BEFORE. FOLLOW ENCLOSED INSTRUCTIONS. AVOID CONTACT WITH EYES. RINSE IMMEDIATELY IF PRODUCT COMES INTO CONTACT WITH THEM. DO NOT USE TO DYE EYELASHES OR EYEBROWS. RINSE HAIR WELL AFTER APPLICATION. WEAR SUITABLE GLOVES. KEEP OUT OF REACH OF CHILDREN. THIS PRODUCT IS NOT INTENDED TO BE USED ON CHILDREN. ENCLOSED INSERT CONTAINS IMPORTANT HEALTH AND SAFETY INFORMATION. READ ACCOMPANYING DIRECTIONS PRIOR TO USE. THIS PRODUCT CONTAINS INGREDIENTS WHICH MAY CAUSE SKIN IRRITATION ON CERTAIN INDIVIDUALS AND A PRELIMINARY TEST ACCORDING TO ACCOMPANYING DIRECTIONS SHOULD FIRST BE MADE. THIS PRODUCT MUST NOT BE USED FOR DYEING THE EYELASHES OR EYEBROWS - TO DO SO MAY CAUSE BLINDNESS.